Simpsons Chubby 2 Super Badger Hair Shaving Brush is world famous for its superior quality and for being entirely handmade in England. Packed full of Super Badger Hair this brush will provide many years of faithful service as well as going a long way to helping you achieve the perfect shave. This superior shaving brush will exfoliate the skin, lift and soften the beard prior to shaving. This is one of the the largest Simpsons brushes. 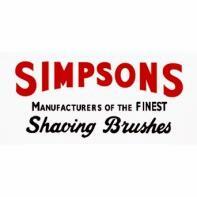 Simpsons shaving brushes are thought by many to be the very best in the world. On a par with Silvertip Badger Hair- the very best grade of badger hair available anywhere in the world and is very hardwearing but still very soft and flexible. Wet the brush in warm water, flick off excess water. Gently swirl the brush in shaving cream or soap and create a rich, creamy lather.Paint the lather onto your bearded area. Don't splay the brush hairs. Truly luxurious, this Super Badger Hair Brush will work an exceptional lather with soaps and creams. Simpsons has been making handmade shaving brushes in England since 1919, it fully deserves its reputation as the world's premier shaving brush manufacturers. Not for you? Click here to browse our complete collection of shaving brushes to find one suited to you. Top of the range Super Badger hair.